(Map Credit) Venture capital invested as a percentage of gross metropolitan product. Top-10 Metro Ranking: 1. San Francisco 5.5%, 2. Seattle 2.7%, 3. Austin 1.8%, 4. Boston 1.5%, 5. Raleigh-Durham 1.4%, 6. Denver 1.2%, 7. San Diego 1.0%, 8. Grand Rapids 0.5%, 9. Wash. D.C. 0.4%, 10. Portland 0.4%. This morning's Seattle Times ran a story indicating that venture capital fundraising among local VCs (Ignition, Madrona, OVP, Voyager, Fluke, Maveron and others) is strengthening, with institutional investors beginning to play a larger role alongside wealthy angel investors. In a broader sense, what does this trend tell us about equity investing and the stock market? PWC's MoneyTree Report provides quarterly data on venture capital investment activity in the United States. 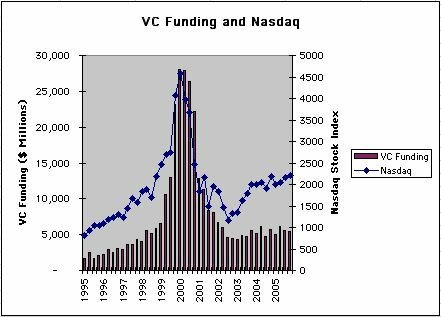 The graph below to the left shows how the quarterly dollar amount of VC funding compares to the level of the Nasdaq stock index for the period from 1995 to 2005. Clearly there is a tight relationship between the tech bubble of 2000 and VC money chasing every variety of Internet deal around that time. 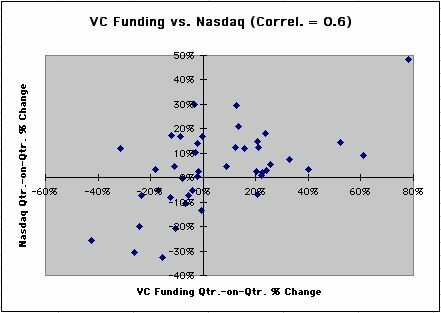 The scatter plot to the right confirms the strong correlation (0.6) between quarter-on-quarter percent changes of VC funding and the Nasdaq over this 11-year period. The MoneyTree Report for 2005Q4 includes a breakdown of VC funding by industry and company growth stage. As expected, the various technology sectors--particularly software, biotech, telecom, medical equipment, semiconductors and networking--received the bulk of the $21.7 billion in venture funding during 2005. Early stage ($3.4 billion in 747 deals), expansion ($7.8 billion in 1065 deals) and later stage ($9.7 billion in 952 deals) companies represent some 97% of the total. However, notably, between 2004 and 2005, startup/seed funding, although just 3% of the overall total, showed a very large percentage increase in new dollars invested, soaring 81% from $407 million in 2004 to $736 million (in 175 deals) in 2005, versus the largely unchanged grand total for VC funding as a whole. Given the strong historical correlation between VC activity and performance of the Nasdaq, anecdotal evidence of renewed interest among institutional and individual investors in advancing capital to fund new ventures bodes well for the stock market. This is not to say that VC activity drives stock prices, nor vice versa. However, I would venture (pun intended!) to guess that the growing confidence private equity investors are showing in funding new ventures, particularly startups, is indicative of a broader sense of confidence in the larger public equity markets as well. The current buzz surrounding Web 2.0 revolves around the tremendous social networking potential that a community of users brings to the Internet, with the likes of MySpace, Flickr and Wikipedia captivating collective mindshare. Measured in economic terms, we can speak of utility or economic value generated by the network connectivity that Web platforms enable. How may we understand the value being created by this network? The growth of technology and, more specifically, the Internet has rapidly changed the financial landscape: Microsoft's shrink-wrapped software sales minted thousands of millionaires over the past two decades. Yahoo's Web services turned its founders into billionaires. And less than two years after Google's IPO, its AdSense service has catapulted its founders onto the rarified list of deca-billionaires. If our world operates under Kurzweil's law of accelerating returns, it is natural to state that the value-creation game is just getting started, with the the best and biggest yet to come (or, as the old saying goes, "You ain't seen nothing yet!"). 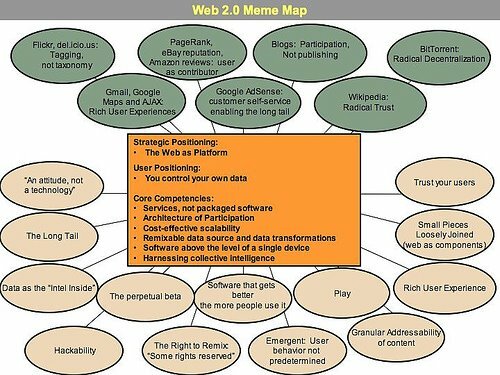 Social networking and Web 2.0 are certainly "just" another growth stage among many--with still more profound surprises to follow. Below I provide my assessment of how the value of the network scales with connectivity as our technocentric world advances. Back in 1998 when eBay went public with its auction platform built on its enviably "clean," no-need-to-touch-the-merchandise business model, the investment community experienced a remarkable rendition of Metcalfe's law in action. We understood eBay's stellar success and speed to profitability in terms of "the power of the network," through which the number of pairwise linkages between nodes (individual participants) scales not linearly with number of participants (N) but quadratically as N-squared (N2). For each of N sellers, there are N-1 potential buyers, giving a total of N x (N-1) possible buyer-seller pairings. 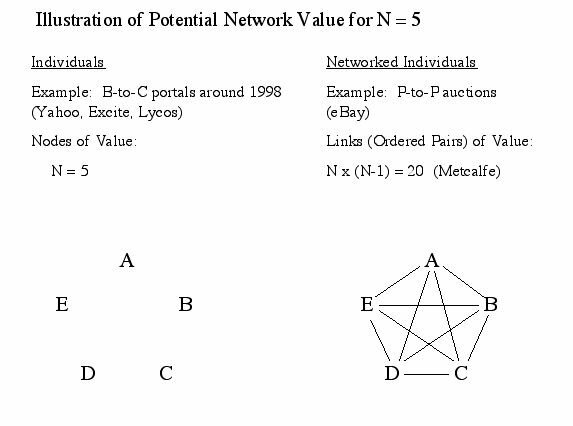 For example, in the case of five individual participants (N = 5), the economic value of the network in not proportional to just five PCs running five copies of Windows OS and IE to browse B-to-C portal sites like Yahoo, Excite and Lycos circa 1998; instead, much greater value comes from all of the 5 x 4 = 20 potential buyer-seller pairings that eBay's P-to-P auction platform enables. See the connected chord diagram to the right in the figure below for the standard graphical representation of this five-participant network. 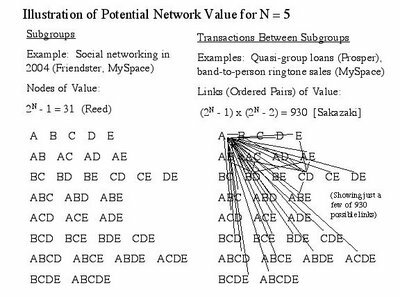 About a year following eBay's IPO, David P. Reed published a paper in which he discussed how the value of a network is rooted in more than just the pairwise transactions between individuals, pointing out the additional value in the group affiliations of individuals. 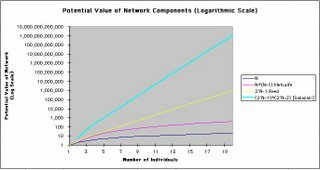 Now called Reed's law, this principle asserts that the value of a network scales as the number of potential subgroups of individuals comprising the network. A straightforward combinatorics exercise (summing up binomial coefficients) gives 2N - 1 as the total number of subgroups, including one-person subgroups and ignoring only the trivial null set (i.e., the empty subgroup with nobody in it). Our example for N = 5 gives 25 - 1 = 31 subgroups, as shown in the diagram to the left of the figure below. Note that for all positive integers N, Reed's law produces more potential sources of value than Metcalfe's law does, i.e., 2N - 1 (Reed) is always greater than N x (N-1) (Metcalfe). Reed's law helps us understand why Rupert Murdoch's News Corp. paid $580 million last July to buy Intermix, owner of youth-oriented social networking site, MySpace. Recent market commentary surrounding an offer to buy the less trafficked college-oriented social networking site, Facebook, indicates that Murdoch's purchase of MySpace, now ranked fifth in Internet traffic among all English language sites (trailing only Yahoo, Google, MSN and eBay, according to Alexa), may have been the "purchase of the century." From the commentary, we can infer that the current market value of MySpace (a private company) is most likely at least a few billion dollars, with value coming from the myriad group affiliations so readily enabled by the MySpace platform. 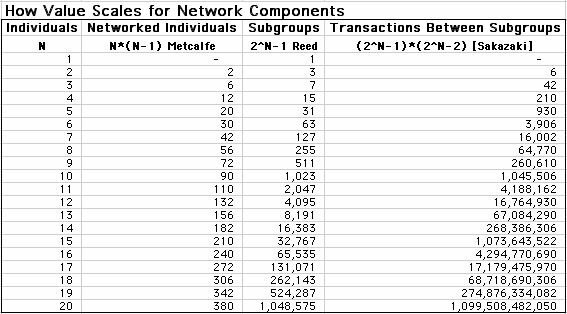 Now, Metcalfe's law focusses on transactions between individuals and Reed's law counts the number of possible subgroups (i.e., group affiliations). What happens if we combine these two ideas and start to examine the potential for transactions between subgroups? In other words, let's consider a "meta-level" that arises when we allow all of the subgroups themselves not just to co-exist in affiliations but actively to interact with each other. 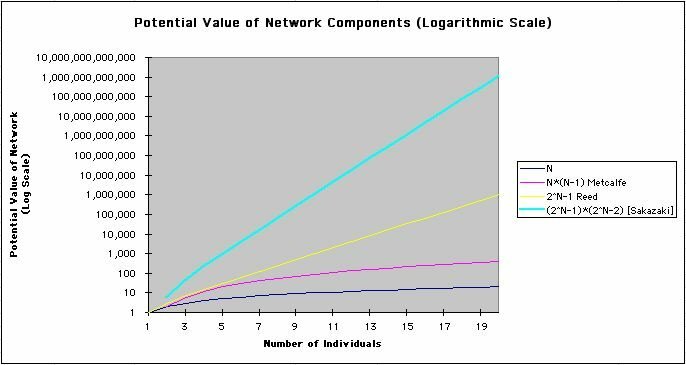 We can enumerate the potential scale of the network as follows: For pairwise (two-party) interactions between the 2N-1 subgroups, we have (2N-1) x (2N-2) potential transactions, which scales as 2N x 2N, or 22N. More generally, we can also sum up the number of all three-party, four-party and higher-order, multiple-party transactions (again using combinatorics of binomial coefficients) to arrive at the formula 22N-1 - 1, which scales as 22N. Importantly, notice how the exponent itself is a rapidly growing exponential function! Plugging in numbers for our example with N = 5, we have: 31 x 30 = 930 potential two-party transactions, and a much, much larger number (231 - 1 = 2,147,483,647) of potential multiple-party transactions. 1. Invididuals: The number of individual members scales linearly as N.
2. Networked Individuals: The number of pairwise transactions between individuals scales quadratically as N2 (Metcalfe's law). 3. Subgroups: The number of subgroups (group affiliations) scales exponentially as 2N (Reed's law). where a, b, c, dpair and dmulti are constants. The table to the right shows how the above four components of network value grow as the size of the network increases. For the fourth (transactions between subgroups) component, I calculate using only lowest order (two-party) transactions, which suffices to display the spirit of the analysis. 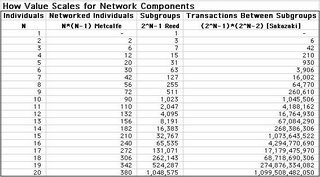 For N = 10 individuals, the scaling is N2 = 100 transactions between paired individuals, 2N = 210 (approximately a thousand) subgroups, and 22N = 220 (approximately a million) transactions between subgroups--i.e., 10 vs. 100 vs. 1,000 vs. 1,000,000. Observe how for N = 20, the fourth component (i.e., the meta-level) becomes even more significant: 20 vs. 400 vs. a million vs. a trillion! The graph to the right illustrates on a linear scale how the four components of value compare to one another. I plot the graph only through N = 5 to allow all four components of value to be visible. Even here, however, it is already very difficult to discern the first three (individual, networked individuals and subgroups) components of value, since the fourth component (number of transactions between subgroups) is overwhelmingly larger. Plotting results on a logarithmic scale allows us to see all four components of value on the same graph. Clearly, for large networks (large N), the value of the network is dominated by all of the possible interactions and transactions between all of the possible subgroups. This interaction potential embodies the richness of the Web that is just beginning to be tapped by new platforms that facilitate transactions between subgroups having a Web presence. Two recently launched examples reveal a surfacing of the "tip of the iceberg" of growth potential. Prosper, a new online marketplace for people-to-people lending that launched in February, allows individuals to join borrower groups and post borrowing needs that are filled by multiple individual lenders through a reverse Dutch auction process. In the language of transactions between subgroups, individual borrowers leverage their group affiliations to transact with ad hoc groups of individual lenders via the Prosper platform. Also of note is the announcement last week of the arrangement between Cingular, InfoSpace and MySpace to enable bands (music groups) to post ringtones for sale to other MySpace members through the bands' MySpace profile pages. Here, we have bands (subgroups) transacting with multiple individuals via the MySpace platform. 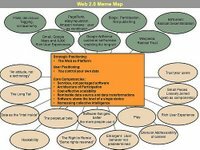 As the build-out of Web 2.0 with its abundance of user-generated and user-edited personal content continues, we should expect to see still richer interactions between freely forming subgroups enabled by Web platforms. I believe that this (inevitable, in my opinion) trend will lead to near-term value creation that is far greater than anything yet seen. If even only a small fraction of the 22N possible transactions among subgroups come to life through Web enablement, we will already see very substantial new value creation. The next few years should give rise to a whole new wave of meta-level value creation--bigger than anything Microsoft, Yahoo, eBay, Google and MySpace have managed to deliver to date. Indeed, we live in extremely exciting times! Picture Caption: Here is my "table" with its "contents." The table is handmade using surplus two-by-fours and stained plywood shelving. 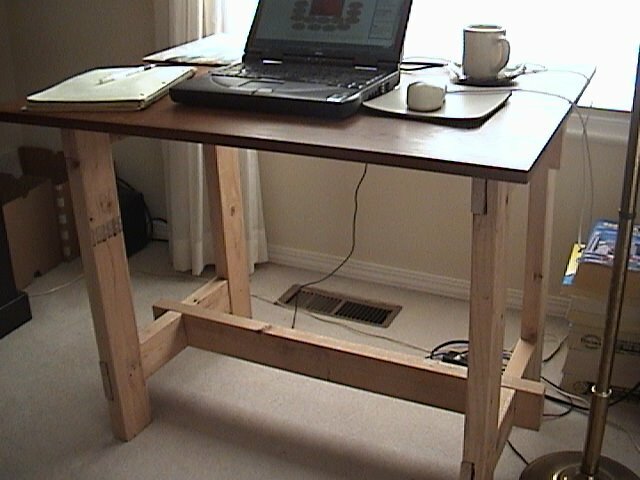 Construction relies on pure wood joinery techniques (i.e., no metal nails or screws). Design enables quick assembly/disassembly (i.e., no tools required) and ease of portability (i.e., table packs flat). Contents consist of my laptop computer with mouse, a spiral-bound notebook and pen, the business section from today's local newspaper, and my ceramic mug resting on a handcrafted triangular saucer. Over the past 15 months, I have posted to this investment blog various comments on stocks, real estate and miscellaneous topics related to investing. An updated directory of links helps readers navigate their way through my thought-maze. Why write about “why,” not “how to”? Why long term, not short term? Why so little allocation to cash? Why public, not private equity? Why stocks, not direct ownership of real estate? Exception: Why own your own house? Why not own a vacation home? Why buy REITs, not your own investment property? Why be a passive observer, not an active business participant? Why focus on the buy-sell decision, not on managing a business? Why stocks, not mutual funds? Why low portfolio turnover, not frequent trading? Why individual companies, not ETFs? Why stick to familiar industries? Why seasoned stock, not IPOs? Why buy companies with earnings? Why low balance sheet leverage? Why look for persistent revenue and earnings growth? Why both safety and hope? Why own both large and small cap stocks? Why a concentrated, not highly diversified, portfolio? Why seek out international exposure? Why look for good relative value? Why stocks, not options and futures? Why not buy on margin? Why not hire a portfolio manager? Why not hire an accountant? Why invest for your own portfolio, not with partners? Why not leverage other people’s money? Why strive to be self-sufficient? Why buy a few dividend-paying stocks? Why save before you spend? Why aim to be debt-free? Why set up a living trust? Why buy quality, not necessarily the lowest sticker price? Why drive a used car? Why encourage your children to buy stock? Below is a directory of links to all of my posts to date, organized into categories that should help anyone interested in understanding the "big picture" behind long-term investing (at least from my humble perspective). Posts added after my revision of this directory on November 6, 2005, are marked "New." Who Gets Rich with Options? Should a Millionaire Be a Coupon Clipper? Do Higher Interest Rates Lead to Lower Stock Prices? Picking the Internet Leader Using "Money Value of Time"
What Causes Residential Real Estate to Appreciate? Whoever Said There's Money in Real Estate? What's the Likelihood of "Making It" as a "Pure" Investor?